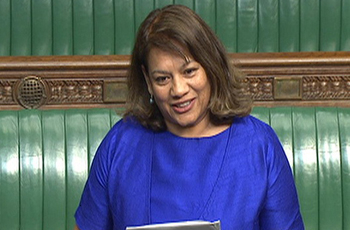 Valerie Vaz has served as Labour MP for Walsall South since 2010. Recently in the June 2017 General Election, Valerie received 25,286 votes, which equaled a 57.4% majority, retaining her seat. She currently serves as the Shadow Leader of the House of Commons. Valerie Vaz is the sister of Labour MP Keith Vaz. Born in Aden, Yemen her parents originated from Goa, India. She later settled in Twickenham and then East Sheen, London. Valerie attended Twickenham County Grammar School, before going on to Bedford College, University of London, where she completed a BSc (Hons) degree in Biochemistry. She also attended Cambridge University to undertake research in animal nutrition. She qualified as a solicitor in 1984. She has worked as a lawyer in local government in London boroughs. She set up her own law firm, Townsend Vaz Solicitors, and has sat as a Deputy District Judge in the County Court on the Midland and Oxford Circuit. In 2001, she joined the Government Legal Service and worked at the Treasury Solicitors Department and the Ministry of Justice. Valerie also worked as a presenter and interviewer for the BBC TV programme Network East in 1987. Valerie was a Councillor in the London Borough of Ealing of from 1986-90, and was the council's Deputy Leader from 1988-1989. Prior to her election to Parliament in 2010, Valerie stood unsuccessfully as a parliamentary candidate in the constituency of Twickenham in the 1987 general election, and in the 1999 European elections in the East Midlands. Valerie is married to Paul Townsend. The couple has one daughter.